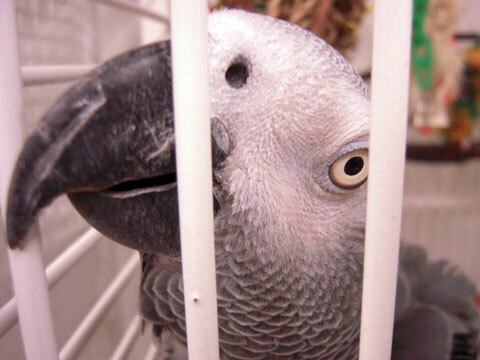 Feather picking (feather destructive behavior) is a relatively common condition among pet birds which tends to predominate in African gray parrots, Quakers and various cockatoo species; however the condition can occur in any pet bird. Feather picking can often be frustrating to owners, and achieving a correct diagnosis and cure of the underlying condition can prove challenging for even the most experienced avian veterinarian. While the condition presents itself as a cosmetic one, it may have a serious underlying cause. Feather picking is more accurately defined as a symptom rather than a specific disease. There are many different possible causes of feather picking. Broadly, these causes are categorized into two groups: medical and behavioral. Medical picking can occur secondary to an underlying disease which causes the bird pain, irritation and or direct feather damage. Examples of medical causes of feather picking include: internal or external parasites; kidney damage or failure; ovarian or testicular disease; musculoskeletal problems; gastrointestinal diseases; certain viral conditions; primary bacterial or fungal dermatitis; allergic skin disease; nutritional deficiencies-such as those seen with birds on an all seed diet. In order to diagnose these medical causes, a variety of diagnostic tests may be required in addition to a thorough history and physical exam. Behavioral feather picking is often thought to be secondary to boredom. In the wild a bird’s day is filled with activity from the first light of dawn until dusk. Birds spend the majority of their day foraging for fresh food and water, and finding secure nesting /roosting sites. Socializing with other birds and preening themselves as well as other members of the flock can also fill a significant part of their day. In the comforts of our homes birds often need only walk a few inches along a perch to find large dishes full of plentiful nourishment. They are often alone for many waking hours as the other members of their flock (us) leave the roost and go to work or school for the day. Many pet birds lack a companion for company or mutual preening and may over groom themselves in response. Unfortunately, the purchase of a companion may not cure a bird that is already picking, and in some cases may even worsen the situation due to incompatibility. In addition to boredom, lack of exercise, inappropriate sleep patterns, and poorly directed reproductive behaviors can often manifest as feather picking as well. When attempting to diagnose and treat feather picking in birds we first aim to exclude medical causes. This approach is taken so that serious and potentially life threatening diseases are not over looked. Additionally, this approach may allow us to diagnose more minor conditions that while not life threatening, can cause serious feather picking. Unfortunately, if left untreated for long periods of time, feather picking can become habit forming. This could mean that when the instigating cause is cured, the picking may continue. The assumption that all feather picking is behavioral is simplistic, incorrect and may have potentially serious ramifications for the patient. Only when we are confident that all underlying medical causes have been ruled out will we consider the condition to be behavioral in nature.